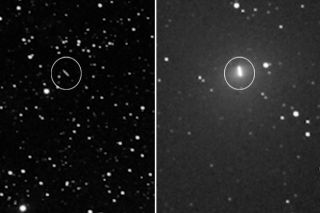 Imagery captured by the Slooh Community Observatory's Chile Observatory Telescope showing comets 252P/LINEAR (right) and 2016 BA14 as they flew past Earth on March 21 and March 22, 2016, respectively. A pair of comets zoomed past Earth over the past few days, and their historic one-two flyby punch was caught on video. A telescope in Chile operated by the online Slooh Community Observatory captured video of the comets 252P/LINEAR and 2016 BA14 as they cruised past Earth on Monday and Tuesday (March 21 and March 22), respectively. 252P/LINEAR came within 3.5 million miles (5.6 million kilometers) of the planet, and 2016 BA14 got even closer — about 2.1 million miles (3.4 million km), or nine times the Earth-moon distance, according to Slooh representatives. Only one comet in recorded history has come closer to Earth than 2016 BA14, they added — Comet D/1770 L1 (Lexell), which zoomed past at a distance of 1.4 million miles (2.2 million km) in 1770. Comet 252P's flyby was the fifth-closest in recorded history, scientists have said. Comet 2016 BA14, which is only about 375 feet (115 m) across, is considerably dimmer and appears as a mere dot moving across the sky. BA14 is only visible with the aid of a powerful telescope. Greg Hogan was so equipped. He imaged BA14 on Monday night from Kathleen, Georgia, using a Canon EOS 7D camera and a Celestron telescope. Astrophotographer Greg Hogan created this animated view of Comet 2016 BA14 by combining 85 shots taken over 20 minutes from Kathleen, Georgia during the objects close flyby of Earth on March 21, 2016. The comet appears as a faint smudge moving from top right to bottom left. This NASA graphic shows the paths of comets 252P/LINEAR and P/2016 BA14 during their flybys of Earth in March 2016. Comet 252P came within 3.3 million miles (5.2 million kilometers) on March 21, while BA14 zipped by at a range of 2.2 million miles (3.5 million km) on March 22. "I did a 15-sec exposure for 85 shots and compiled them all together," Hogan told Space.com via email. The resulting GIF — in which BA14 can be seen zipping diagonally from upper right to lower left near the center of the frame, shows "how fast it is moving across the sky in just a 20-minute window," Hogan added. Comet 252P was discovered by MIT's Lincoln Near Earth Asteroid Research (LINEAR) survey in April 2000. BA14 was spotted just two months ago, on Jan. 22, by the University of Hawaii's PanSTARRS telescope. The two comets' orbits are so similar that researchers think the objects may be related. It's possible that BA14 is a fragment that broke off of 252P during one of the latter body's previous trips around the sun, scientists have said. Editor's Note: This article was updated on May 12 to reflect a revised Earth flyby distance of 3.3 million miles (5.2 million km) for Comet 252P/LINEAR.